If you happen to be riding your trike along the breathtaking Oregon coast, and you do the entire 380 mile route that spans the ocean between Washington and California, you will be traveling through the central coastal town of Florence, which is the midpoint of the journey in either direction. I have lived here since 1995. The signed route by the state is actually 370 miles, but I highly recommend a 10 mile extension through the Three Capes Scenic Area just south of Tillamook for incredible views and awesome camping near the cliffs. As a manner of showing you ahead of time what trikers, or even bicyclists for that matter, will find here, I present a little 21 minute movie I created to introduce you to this scenic region of the state, and more specifically, the town itself, and the amenities that cyclists will find handy. Riding the coast from north to south is the preferred direction of travel, as the winds during the cycling months tend to blow powerfully out of the north and northwest, thus assisting cyclists with speed and comfort. If you’re one who likes the challenge, then give the south to north ride a shot sometime. That will work you! Here are some photos I took recently so you can see the triker area. 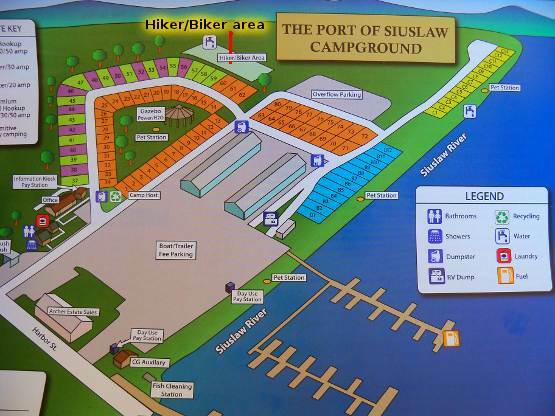 It has water, picnic tables, lawn, windbreaks (the wood structures you see), laundry, showers, gazebo, fish cleaning area (it’s right next to the Siuslaw River – pronounced Sigh-Ooh-Slaw). This campground is adjacent to Florence Old Town if you love to shop for unique things (they’ll mail it home for you). This is looking north. The river is over the sand hill you see to the right. 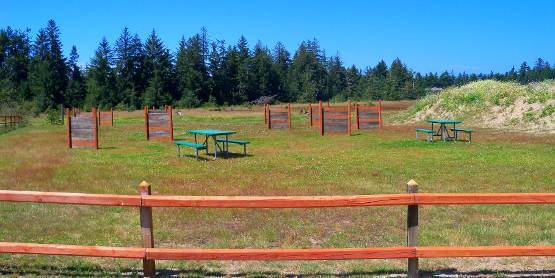 You can pitch your tent behind the wood structures to lessen the wind. Showers and laundry are to the left. There is also free Wi-Fi here, so you can keep your fans advised about your trek.